Alongside his teammates (Monster Clown and Murder Clown), this luchador led his teammates in establishing a record of one of the longest winning streaks ever seen in all history of the Mexican Lucha Libre, after winning 600 in a row, a record that was only broken by rival team Los Perros del Mal. After achieving many victories, having earned many titles, and taking part in the last team ever to have won the Campeón Nacional Atómico title, Psycho Clown only has one more goal in mind: the total annihilation of his deadliest foes, Los Perros del Mal and all members of El Consejo. During the Triplemanía XXII event, he obtained an epic victory after defeating wrestler Texano Jr., thus obtaining his haris, in a match that is considered among the best ones ever seen in an AAA Event. 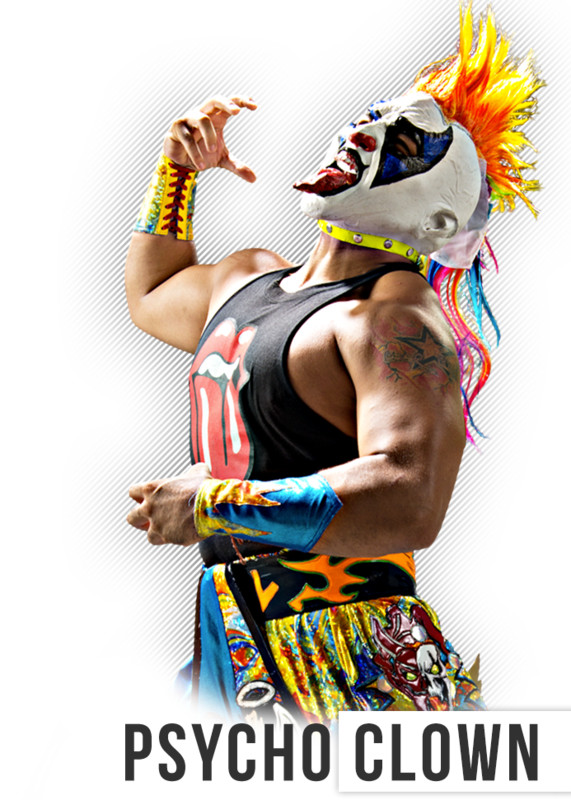 SUPER CRAZY -X-FLY - TEXANO JR.